California– What makes a great teacher? Each and everyone one of us can recall that one teacher that changed our lives. Teachers that inspired us, taught us to pursue our passions and aspirations. On Teacher’s Appreciation Day, Californians for Justice student leaders are honoring ten educators that are closing the Belief Gap and making sure that all students, regardless of their background, have the opportunity to reach their highest potential. 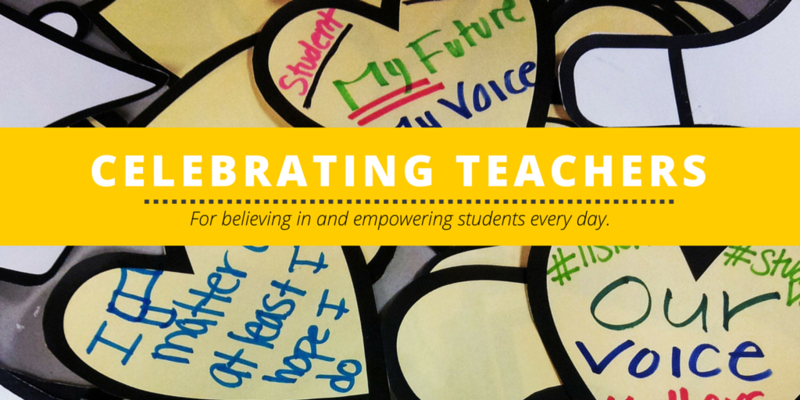 Since the launch of Californians for Justice’s “Believe in Me” campaign last November, hundreds of students across California set out to honor and celebrate teachers that are closing the Belief Gap on National Teacher’s Appreciation day. Students went from classroom to classroom asking their peers to nominate teachers that empower students with the knowledge and skills to reach their highest potential. They collected over 600 teacher nominations in Long Beach, Fresno, San Jose and Oakland to appreciate the powerful and inspirational teachers that have changed and continue to change student lives. In East San Jose, located in the Silicon Valley, Mrs. Leilani Esguerra teaches AVID at James Lick High School. Mrs. Esguerra has dreamed of becoming a teacher since the 5th grade. Now having fulfilled her dream, she helps students reach their dreams as a teacher in AVID, a college prep course that has helped thousands of low-income students of color go to college. She has made the classroom her second home. Teachers were nominated by students based on their ability to engage them, make meaningful connections, and model positive social and emotional behaviors in the classroom. In Fresno Unified School District, Mrs. Cathy Haynes has taught English and Social Studies for 33 years at Edison High School. Her students affectionately refer to her as “Ma Haynes”. Mrs. Haynes teaches because she sees “the power a young person has to change their environment”. Oakland High students in Oakland celebrated History teachers Jesse Shapiro and Emily Macy as teachers that not only engage them academically but socially and emotionally. Teachers like Mr. Shapiro inspire students like Angela to feel connected and engaged in school. Students in Long Beach praised their teachers for being great role models especially when they have few role models in their communities. Ms. Castillo teaches Spanish at Cabrillo High School. She is known for pushing her students to think about their future and preparing to live independent lives. In 2015, Californians for Justice student leaders surveyed 2,000 students and interviewed 150 educators, policy experts, and parents across California. Students overwhelmingly identified school staff and teachers as the most important resource to help them succeed. One-third of students could not report at least one caring adult at school. With this research, Californians for Justice students launched the “Believe in Me” campaign to close the Belief Gap for low-income students of color. The Belief Gap is a lack of belief in the potential of students from low-income families and students of color in our schools. Who is Californians for Justice? We believe that young people are the leaders we need to create the healthy, just and thriving schools all of our communities deserve. We ensure that students have the opportunity to grow as leaders, and we work with them to win campaigns that put Racial Justice and Equity at the center of our schools. ← What’s the State of Education in East San Jose, Oakland and Fresno? Sign up for the webinars.